The group’s commitment to aiding South African economic development by assisting small businesses continues to be a strong focus for the future. Emphasis is placed on skills-based entrepreneurial development and the provision of preferential procurement opportunities to qualifying small enterprises and emerging micro-enterprises that are predominantly black-owned. The percentage of black-owned businesses supported is aligned with the country’s Economically Active Population (EAP) statistics. Tsogo Sun Entrepreneurs is a business benefit and development programme that supports various clusters of entrepreneurs within the value chain of the Tsogo Sun group and within the broader tourism industry in South Africa. The programme provides qualifying entrepreneurs with the business development support and benefits. Through the programme, Tsogo Sun works to establish partnerships with government, corporates, industry bodies, and development specialists to advance their mutual interests in contributing towards the creation of economic growth in South Africa by supporting emerging enterprises. 3. Contribute towards economic growth in South Africa. Tsogo Sun Entrepreneurs proudly supports 133 entrepreneurs throughout South Africa, sustaining nearly 300 jobs and creating more than 2,000 employment opportunities in the value chain. The success of Tsogo Sun’s Book a Guesthouse entrepreneurial programme (one of the four clusters supported by Tsogo Sun Entrepreneurs) is testament to our commitment to developing aspiring entrepreneurs. Visit our entrepreneur directory to browse the products and services provided by these independently owned and operated business or learn more about the inspiring entrepreneurs who run them. 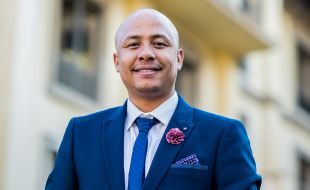 The 2017 Tsogo Sun Entrepreneur of the Year Award was presented to Hezron Louw, owner of Sumting Fresh restaurant and gourmet street food in Gauteng, on 26 October at a gala banquet at Tsogo Sun’s hotel in the Jacaranda city, Southern Sun Pretoria (https://www.tsogosun.com/southern-sun-pretoria). 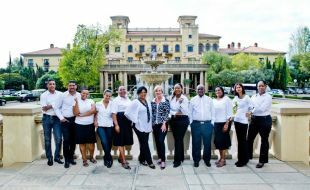 Tsogo Sun Entrepreneurs (https://www.tsogosun.com/citizenship/entrepreneurs) has been enabling entrepreneurial growth and striving for transformation to a more empowered society for 12 years, encouraging many small business successes, providing practical support through a 12-month development programme, and recognising excellent entrepreneurial performance through the prestigious annual Tsogo Sun Entrepreneur of the Year Awards for the programme’s top performers. Sumting Fresh is all that its name suggests – funky and fun, creating fabulous fresh food. It’s the brainchild of Hezron Louw and his business partner Andrew Leeuw; a gourmet street food company with a food truck (‘bus-taurant’), a catering division with a factory in Bramley, and a ‘bricks and mortar’ restaurant in Norwood. Prizes for the winner include R50,000 from Tsogo Sun, a bursary valued at R30,000 from Tsheto Leadership Academy, the programme ambassadorship, among other prizes. Sumting Fresh will also be featured for one month on e.tv and eNCA’s Enterprise Development initiative, Forerunners, which focuses on showcasing small South African businesses and the entrepreneurs behind them. The 2016 winner of the Tsogo Sun Entrepreneur of the Year Award was Nqobile Nkosi, owner of NQ Jewellery Design Services, based in Soweto. The other 2017 finalists were Devina Dawkinun, Gemkids Education and Entertainment Centre, from KwaZulu-Natal; Nicole Msibi, Before Time Indlondlo Events, catering and events equipment and décor hire, Gauteng; Noli Mini, Relax Spas mobile health spa company, Western Cape; and Ronnie Nemukula, Ronem Maintenance Solutions, engineering services in construction, repairs and maintenance, Mpumalanga. Participation in the Tsogo Sun Entrepreneurs programme is open to all South African businesses with an annual turnover of less than R50 million. The three channels through which businesses can join the programme are Tsogo Sun’s national Supplier Showcases, where entrepreneurs with potential for growth exhibit their products and services – some are then identified by Tsogo Sun and invited to join; through membership of the HCI Supplier Club; and through recommendations from the Department of Tourism and tourism agencies who nominate businesses for evaluation by the Entrepreneurs programme. The year starts annually in January with the induction of the new intake of entrepreneurs selected for the programme. At the start of the 12-month programme, the entrepreneurs are each allocated a business mentor and a leadership coach to analyse their businesses and professional performance and then to create a roadmap to help them close gaps in their businesses and develop as leaders to run their businesses effectively. Contact sessions and business foundation skills training workshops are provided locally through the programme to the entrepreneurs in the provinces where they are situated. Tsogo Sun delivers the entrepreneurs programme with the support of several strategic partners, which include Carlson Wagonlit Travel, a programme partner for eight years; Colour Accounting, which provides financial management, marketing, sales and other business training; and Queen Ramotsehoa, whose company, Tsheto Leadership Academy, provides coaching and self-mastery services for personal and enterprise development. A recent partner to the programme is Proudly South African. Midway through the year, entrepreneurs from previous years and the latest intake are invited to enter the Tsogo Sun Entrepreneur of the Year competition. Comprehensive entry forms are evaluated and five finalists are shortlisted and interviewed by a panel of judges. 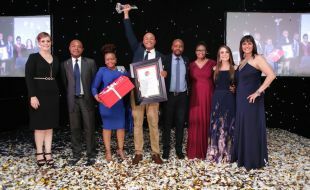 The Tsogo Sun Entrepreneur of the Year Award banquet forms part of a three-day conference that includes an intensive business workshop and a Supplier Showcase, and concludes the Entrepreneurs year-long programme. The dad and daughter Soweto-based enterprise – Before Time Indlondlo Events, a catering and events equipment and décor hire company – was launched when a gap in the market was identified about five years ago and has grown steadily, with a strong 70% year on year growth this year. Nicole Msibi, co-founder with her father Nick Msibi, says they had both been in the hospitality industry, she in catering and as a function organiser, and he as a chef for 30 years. They noticed that at practically every event in Soweto, equipment was hired. It made sense to invest in the sector. Nick resigned from his job and with his pension package, they set up their business, with a warehouse for their equipment based in Protea Glen. Having her own business had been a dream of Nicole’s and she says they put their hearts and souls – and lots of sacrifice – into making it a success. “What makes the business special is that “we don’t only talk service. We make sure that our customers experience value-added service that goes beyond just providing equipment for hire.” Though they started with equipment hire, they recently extended their portfolio to include doing décor at events, and catering – to harness Chef Nick’s skills. While their focus is on Gauteng and particularly Soweto and the surrounds, the business reach is “all over the country” says Nicole. They recently went as far afield as Free State and North West, and are prepared to travel wherever needed. Future plans include a strong market penetration strategy to grow the business and become well known and respected in the industry. At this stage, Nicole is proud of the fact that Before Time has been given the opportunity to service major clients such as Sandton Convention Centre, Rand Club, and Bidvest. She has also identified a need in Soweto for an efficiently run conference centre that can accommodate about 200 people – for meetings, conferences, celebrations, weddings, and other events. Social upliftment and “giving back” is also important to Before Time. The company supports vulnerable children, providing school girls with sanitary protection, school fees for children who cannot afford to pay, and school shoes for children who don’t have any. 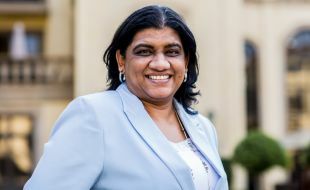 Gemkids’ founder and director, Devina Dawkinun, started her career as a lecturer and researcher in Economics at the then University of Durban-Westville and worked as a researcher in the Department of Community Health. Funding for her post ran out in 2005 and finding herself jobless, Dawkinun decided to pursue her dream of working with children. She studied Early Childhood Development, focusing on the Montessori method, and in 2007 opened her first Montessori pre-school in Chatsworth in Durban. Later, she transformed this into a school of tuition for grades 1 to 7 learners. Years later in 2015, when his passion for building maintenance and construction took root in his life, Nemukula remembered that resolute woman. Determined to combine his passion, the skills he had gained over the years, and the motivation she had inspired in him, he launched his own business. Over the past 13 years Nemukula has been involved in building maintenance in the hospitality and commercial sectors in South Africa and Mozambique. He is still employed by Broll Property Group in Nelspruit on a half-day basis, leaving him free to run his business as well. He has three full-time permanent employees, who include his brother as project manager and his wife, who has a BCom Accounting degree and manages the admin and books, and 21 casual employees – most of whom are employed from local townships where the rate of unemployment is high, and five of whom are women. He is also committed to bringing women into the industry. “We work hard to develop young men and women from the local community and we do a lot of on-site training for our unskilled workers.” Taking it further, Ronem has also encouraged casual workers to become sub-contractors to his company, thus developing their own businesses and creating further employment. Ronem is environmentally responsible and has developed its own policy that ensures that only energy saving lights and equipment is installed in new developments and recommended in refurbishments. The team is committed to complying with all dumping regulations. Sumting Fresh is all that its name suggests – funky and fun, creating fabulous fresh food. It’s the brain child of Hezron Louw and his business partner Andrew Leeuw; a gourmet street food company with a food truck (‘bus-taurant’), a catering division with a factory in Bramley, and a ‘bricks and mortar’ restaurant in Norwood. “It started when Andrew and I met in a taxi years ago and discovered we shared a passion for food – we also realised that if we could just get started, we had the drive to make it. We borrowed from friends and family and put in all our savings to get the equipment we needed,” says Louw. The partners had seen a gap in the market for gourmet-style street food, and the innovative business has grown along with the trend. They started their first food trailer in Midrand in 2012 and worked hard to deliver great quality delicious fresh food and establish a loyal customer base. They began operating at the Fourways Farmers’ Market and then expanded to other markets and to festivals. “We’ve always made sure that we offer consistently good quality food. People love us for our food – and for the fact that we are adamant about serving people with a smile and food full of love,” says Louw. Sumting Fresh has 50 employees, 18 of whom are full-time and the rest part-time. He and Andrew Leeuw have a strong partnership and friendship that has withstood the growing pains of a start-up business. “We are coming through stronger and more focused,” he says, adding that the partners complement each other “like jigsaw puzzle pieces”. Staff training is important and staff are encouraged to do short courses, appropriate to their interests and career choices. The company is a member of Productivity SA, which assists with self-development. “We share our experiences and business journey freely and openly, and encourage our staff to develop themselves,” says Louw. Sumting Fresh is committed to social upliftment and is involved with Thusong Youth Centre, employing young people from their local community – in Bramleyview and Alexandra. “We’ve also identified young people from our Ennerdale community for mentoring and training in factory operations and we support waste traders in the factory environment, setting aside recyclable waste for the traders to collect and sell,” Louw explains. Relax Spas, owned and run by vivacious and determined Noli Mini, has been steadily evolving and growing, creating employment and delivering an innovative service, since it was just a dream in 2010. Mini, who has a passion for beauty and skincare and a penchant for business, has developed a unique spa concept in partnership with various hotels in the Western Cape, offering in-room spa services to guests from a base within hotels. “We align our offering with the hotel brand, increasing the range of facilities that the hotel offers and provide high quality branded spa experiences for the guests,” she says. Mini started in 2010 as a ‘mobile spa therapist’, going to different hotels and offering mobile spa treatments. The concept has evolved and Mini has set up bases, including two Spa Suites, at various hotels and guest houses. An additional aspect of Relax Spa’s offering is to provide spa treatments at corporate wellness days. She is also introducing her own brand of beauty and skincare products. Relax Spas has 10 full-time staff and three interns. The company is in the process of recruiting four full-time spa therapists to accommodate the growing demand for its services. Although currently based in the Western Cape, Mini has her eyes set on a national footprint for Relax Spas in the future. “This industry has been my love since I was a little girl, inspired by my mother’s interest in skincare and makeup. My first part-time job was in Grade 11 when I worked as a beauty consultant for skincare products and makeup in a department store,” says Mini. Mini grew up in Madubela Location near King William’s Town in the Eastern Cape before the family – parents, two sisters and a brother – moved to East London, where she matriculated from Clarendon High School for Girls. She then studied at a beauty academy and worked at two spa companies for eight years before branching out on her own. “It’s not been an easy road, but it has been wonderful. I think that once one identifies one’s purpose in life, fulfilling it comes quite naturally. Mini is also in the process of establishing an academy to train beauty therapists. “A challenge is that we have a lot of therapists asking for work, but they don’t have a high enough standard of training for our services. Our academy will train to those standards, and the students will have access to hands-on practical training at Relax Spas, and the potential to be employed if they make the grade.” The academy will start in 2018 with five students. Mini is also active in social upliftment, and has partnered with Relate Trust, an organisation that supports different NGOs. She sells their bracelets, handmade by women in a local township, and the proceeds go to the Amy Biehl Foundation, which offers training to unemployed young women in beauty skills, among other initiatives. She says she learned that there is no greater sign of confidence than self-acceptance and that she has grown enough to accept her flaws and embrace who she is. 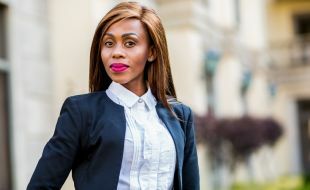 Mini adds that Tsogo Sun Entrepreneurs is helping to fill in some gaps in the development of her business, and very importantly, connecting her to the strength of Tsogo Sun. 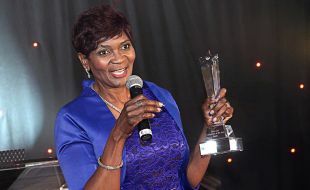 The winner of the Tsogo Sun Entrepreneur of the Year 2015 Award is Nomsa Mazibuko from Visit Vakasha Guest Lodge in Mpumalanga, who competed against five other finalists for the top spot at the awards ceremony at Southern Sun Pretoria on 9 October. As Entrepreneur of the Year, Nomsa is now the programme ambassador for the next 12 months. She will also receive R20 000 from Tsogo Sun and a business bursary valued at R18 000 from Tsheto Leadership Academy. The other finalists in the Tsogo Sun Entrepreneur of the Year Award were Tracey Naude from Cacey Hotel Management CC in the Western Cape; Lilanie Blignaut from Lilaton Management CC in Gauteng; Jesse Mbewe from JC Cleaning Services in Gauteng; Benita Cyster from Lumley’s Place in the Western Cape; and Lizelle Maurice from Park Place Boutique Guesthouse in the Eastern Cape. Tsogo Sun Entrepreneurs is a comprehensive benefit and support programme that can be adapted for different business types, providing an over-arching and practical range of offerings that have proven to contribute to the growth and success of emerging businesses. Tsogo Sun Entrepreneurs incorporates 170 entrepreneurs, which includes 120 guesthouse owners. More than 300 jobs are sustained by the businesses, of which 88% are women-owned. Tsogo Sun has significantly expanded its successful Book a Guesthouse programme to include Sun1 hotel operators and housekeepers, to form Tsogo Sun Entrepreneurs, an innovative entrepreneurial development programme for the hospitality industry. This move saw a boost in numbers last year with an additional 15 in the Book a Guesthouse programme and 23 Sun1 operators. It was expanded further this year with the inclusion of 10 housekeepers into the programme, bringing the total number of entrepreneurs supported from 85 entrepreneurs to 133. Tsogo Sun Entrepreneurs is a business benefit and development programme that supports various clusters of entrepreneurs within the value chain of the Tsogo Sun group and within the broader tourism industry in South Africa, to support entrepreneurs to develop professionally-operated, compliant, sustainable businesses. “The continuing success of the Book a Guesthouse programme and our commitment to entrepreneurial development, together with the ever-present need for job creation in South Africa, were drivers in this decision to expand our programme to include more beneficiaries and offer a higher level of support, benefits, and services to them,” explains Candy Tothill, Tsogo Sun’s General Manager: Corporate Affairs. “Tsogo Sun Entrepreneurs forms part of the company’s far-reaching sustainability in tourism programme and features a number of established partnerships with government, corporates, industry bodies and development specialists to advance our mutual interests in contributing towards the creation of economic growth in South Africa by supporting emerging enterprises,” adds Tothill. MEDO (Micro Enterprise Development Organisation), which has been a partner with Book a Guesthouse for several years, has now stepped up its involvement in Tsogo Sun Entrepreneurs and expanded its offering to cover a wide range of support services, as well as discounts and special offers on various products and services; procurement support; travel arrangements; access to SMEasy Accounting systems; tender alerts and corporate listings. Other partners that work with Tsogo Sun Entrepreneurs include Beyond Coaching and Tsheto Leadership Academy, which bring coaching and training to the entrepreneurs, depending on the intervention required. Beyond Coaching offers a complete repertoire of coaching and related services for personal or corporate and business development purposes. The Tsheto Leadership programmes are developed to ensure the entrepreneur has the capacity for self-leadership to enable them to succeed. It has the licence to use specific coaching tools. Tsheto Leadership is owned and operated by Queen Ramotsehoa, while Rienzo Colpo is Director for Beyond Coaching. 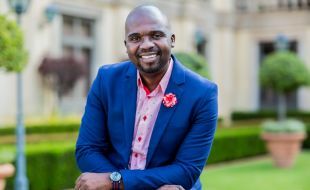 Tsheto sponsors the Tsogo Sun Entrepreneur of the Year Award Winner to receive training in Master 1 - The Awareness Process, which is then delivered by Beyond Coaching. Both partners provide training based on the subject materials allocated to them in the Tsogo Sun Entrepreneurs – Handbook and group coaching sessions for individual entrepreneurs. When entrepreneurs are newly inducted into the programme, they are required to complete a training and development course over one year, after which they are assessed and go on to become alumni or are given further individualised training according to their assessment. Alumni continue to receive benefits and support on the basis of continued adherence to excellence. The Tsogo Sun Entrepreneurs programme culminates in an annual conference at one of Tsogo Sun’s properties. 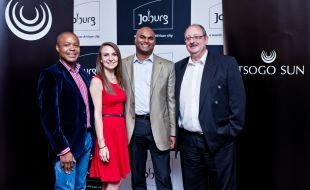 “The growth of the programme highlights Tsogo Sun’s ongoing commitment to tourism and the South African economy. More than that, the programme uncovers business people with significant potential for success within the country and those with the capacity to create sustainable businesses of an outstanding standard,” says Tothill. Lumley’s Place is a four-star bed and breakfast, situated in the village of Pniel in the Cape winelands, and it’s a first generation family business. “We started the business in December 2008 to leave a legacy for our children. We believe that in the current economy, entrepreneurship is the way to go,” explains owner, Benita Cyster. At the moment, a further two rooms and a cottage are under construction at Lumley’s Place, after which, Cyster’s dream is to build a conference centre to accommodate the many requests they receive to host events and functions. Training is an important part of the business and Benita says she trains her employees every day. “I need my passion to rub off on my staff. They interact with my guests and our aim is to make our guests’ day, every day!” Lumley’s Place has a staff compliment of 6 people, including three full time employees and the Cyster family themselves. 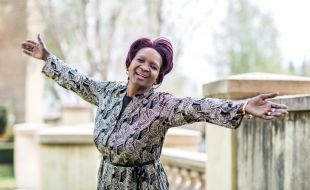 Benita says that being part of Tsogo Sun Entrepreneurs has already opened doors for her business – and organisations such as Stats SA and the Auditor General have made use of her accommodation facilities as a result. “Being a Tsogo Sun Entrepreneur is life-changing,” she says. 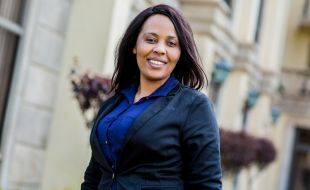 Jesse Mbewe entered the hotel industry nearly twenty years ago and what began as a career developed into her operating a successful business of her own. “My passion grew as I watched my supervisors in my very first position after I completed matric. I worked as a room attendant in a hotel housekeeping department and I did my best.” She was quickly promoted to room and laundry supervisor, and then fulfilled various positions within the hotel environment, including receptionist, beverage manager and executive housekeeper. Leadership is the most important thing that Lilanie Blignaut, owner of Lilaton Management cc is learning from Tsogo Sun Entrepreneurs. Her business operates the Sun1 hotel in Hatfield, Pretoria. “I have learnt that for your business to be a success, you need productive employees, and to have productive employees you need to invest in them,” she says. Lilanie is training her 19 permanent and five casual employees on a three-month rotation basis – giving them development on hygiene, first aid, fire drills and responsible use of energy and water. She also keeps them up to date on developments within the hospitality space to ensure that they are completely equipped to serve guests exceptionally. She says she has gained self-confidence through the Tsogo Sun Entrepreneurs programme, which is making a difference to her employees’ experience in the workplace. She recongises their strengths and abilities, and trains and promotes them accordingly. Since she was a small child, Lilanie had always wanted to be in the tourism industry and she considers herself fortunate to have been able to get a foot in the door in 1999. Constant self-improvement and studying have been part of her career and at the moment she is completing her second year in a degree in Business Management through UNISA. Lilanie believes that her management company provides a unique experience because of the business’s service ethic. “We go the extra mile for our guests. We try to exceed their expectations – and we are easy on the budget.” Over the next few years, Lilanie intends to increase her client base and extend her management company’s special brand of service to more customers within the industry. Park Place Boutique Guesthouse is a four-star, award-winning Victorian manor house in East London, offering luxury accommodation to business and leisure travellers. “We have 27 rooms – 12 standard and 15 luxury – as well as conference facilities, a fully licenced bar, and a restaurant called the Scarlet Ibis, which means we offer breakfast, lunch and dinner to our guests,” says owner Lizelle Maurice. Lizelle started the business "because being hospitable runs in her family’s blood". “I think that we Caribbean people are naturally hospitable,” she says. “We love entertaining and we have travelled quite extensively.” The Maurices realised that there was an opportunity in the market for a luxury guesthouse in East London – and set about establishing one. Lizelle is also involved in local social development and she is an executive member of the Business Women’s Association, overseeing their mentorship portfolio. Park Place also supports an NGO called Salem Baby Day-care. “Visit Vakasha Guest Lodge was named to encourage guests visit us and return again and again,” says owner Nomsa Mazibuko. The guesthouse specialises in accommodation, catering and conferencing for both the public and private sectors. The guesthouse started with eight rooms and due to its popularity, has grown to the present 24 rooms over the last few years. The conference centre is in the process of being expanded from its current capacity of 150 people to 250. Nomsa, who was cleaning rooms as a housekeeping attendant for Tsogo Sun in 1998, had no idea at that time that becoming a business owner was the direction that life would take her. But she is quick to recognise and make the most of opportunities. “I am enjoying every moment of it. I don’t feel like I am working, I feel as if I am just having fun all the time! I am people-orientated and I treat customers like family. We have made our guesthouse homely, friendly and intimate to make sure that it is truly a home away from home,” she explains. “Loving people and wanting to spend time with them is my skill. I do it so easily and this industry allows me to have a connection with people. I am passionate about it!” She says that when she started, she didn’t have the skills to do what needed to be done so she taught herself and studied through the University of Cape Town, doing courses in guesthouse and restaurant management. Being a hands-on business owner is always demanding, but when your business provides the operations for two hotels that are situated 450km apart, it takes a very skilled person to effectively deliver on the requirements. That’s Tracey Naudé – whose business, Cacey Hotel Management cc has been operating the Sun1 Milnerton and Sun1 Beaufort West hotels in the Western Cape for the past four years. Tracey’s journey as an entrepreneur started in 2001 when she was contracted to operate a hotel at the tender age of 24. Her passion for the hospitality industry was already blossoming before that when she worked in hotel operations, and she says that her past experience continues to help her fulfil the current demands of being a business owner. Tsogo Sun’s far-reaching enterprise and supplier development programme has taken a significant step forward with the formation of a partnership with the City of Joburg – Department of Economic Development and the incorporation of a new supplier development cluster situated within the successful Tsogo Sun Entrepreneurs programme. The Tsogo Sun Entrepreneurs programme was extended earlier this year to support a range of small, medium and micro enterprises within various clusters connected to the value chain of Tsogo Sun and those that serve the broader South African tourism industry. The clusters comprise 100 guesthouse owners, 23 independent operators of Sun1 hotels, and 10 individual housekeeping businesses. The programme’s new supplier development cluster was launched last week, when a cross-section of 126 promising suppliers were invited to attend the Tsogo Sun Entrepreneurs Competitive Supplier-Buyer Matchmaking session held at Gold Reef City Theme Park Hotel. The session was hosted by Tsogo Sun in partnership with the City of Joburg – Department of Economic Development, and sought to provide market and development access to these businesses. Tsogo Sun Entrepreneurs incorporates a one-year training course, after which the entrepreneurs are assessed and go on to become alumni, or are given further individualised training according to their level of achievement. Alumni continue to receive benefits and support on the basis of continued adherence to excellence.